The Indiana Republicans just can’t get enough of trouncing on our public school system and the parents who stand by it. Once again, just to reinforce their love of anything non-public, Republicans gussied up the now-legal package of enticements to draw students away from Indiana’s public schools. A beneficial tax deduction – one not available on an equal basis to the parents of public school students – was included in last year’s legislation. Come April 17th, parents of home-schooled students and private school students will be the beneficiaries of a tax deduction of $1,000. But, if your children attend our public schools, don’t look under the Christmas tree – or for a tax-line deduction – for an extra gift to help with all the hundreds of dollars in expenses attendant to public school enrollment. The presents are all going to the private schools and the charter schools while throwing in a bone to home-schoolers. The Republican war on our public school system is inexcusable, and, make no mistake, it is a war. Daniels and Bennett have made no bones – or apologies for that matter – about their desire to weaken our public schools. While they continue to pooh-pooh that assertion, folks, actions speak louder than words. One has to hand it to the Guv – he has figured out a way to sign the bill defunding Planned Parenthood while knowing that enforcement of the bill may very well be enjoined. His actions are pure and straightforward manipulation with women as the pawns in his game of presidential chess. I am sure there are those who will say what an absurd conclusion, but Daniels knows he is already in hot water with the social conservatives. His statement last year that a “truce” on social issues may have to be called infuriated those who pride themselves on stepping into the private lives of individuals – especially in the area of abortion rights. His latest fiasco with defunding Planned Parenthood showcases just what lengths he will go to in order to traverse the maze of earning and keeping support for a presidential bid. Indiana’s Medicaid program – of which Planned Parenthood is a funding recipient – operates under United States Code Title 42. Public Health and Welfare, and a set of federal regulations called the Code of Federal Regulations (C.F.R.). § 431.51 Free choice of providers. (a) Statutory basis. This section is based on sections 1902(a)(23), 1902(e)(2), and 1915(a) and (b) and 1932(a)(3) of the Act. (1) Section 1902(a)(23) of the Act provides that recipients may obtain services from any qualified Medicaid provider that undertakes to provide the services to them. (2) Section 1915(a) of the Act provides that a State shall not be found out of compliance with section 1902(a)(23) solely because it imposes certain specified allowable restrictions on freedom of choice. (3) Section 1915(b) of the Act authorizes waiver of the section 1902(a)(23) freedom of choice of providers requirement in certain specified circumstances, but not with respect to providers of family planning services. (4) Section 1902(a)(23) of the Act provides that a recipient enrolled in a primary care case management system or Medicaid managed care organization (MCO) may not be denied freedom of choice of qualified providers of family planning services. (5) Section 1902(e)(2) of the Act provides that an enrollee who, while completing a minimum enrollment period, is deemed eligible only for services furnished by or through the MCO or PCCM, may, as an exception to the deemed limitation, seek family planning services from any qualified provider. (6) Section 1932(a) of the Act permits a State to restrict the freedom of choice required by section 1902(a)(23), under specified circumstances, for all services except family planning services. 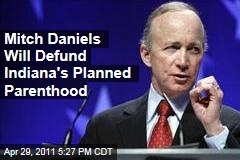 Here is where Daniels has outdone himself on the backs of women’s healthcare services. Daniels will sign the bill – all the while knowing that he and his Republican minions cannot legitimately restrict freedom of choice – that is pretty plainly set out in the above C.F.R. sections. If the Republicans do this, and it isn’t countered by a lawsuit, Indiana is in jeopardy of losing its Medicaid funding. But, Daniels knows that Planned Parenthood will file to enjoin enforcement of his signing of the bill – even before the ink is dry. Given the explicit sections above, the court should grant the injunction prohibiting the state from denying funds to Planned Parenthood. I say should since it all depends on how willing the court will be to uphold the federal regulations – states’ rights raising a corollary issue. This gives Daniels much needed cover with social conservatives, which he desperately needs to rehabilitate his standing in their eyes given his apparent previous willingness to back off social issues. They will be thrilled that he “stood strong and signed the bill”. Daniels, on the other hand, will be patting himself on the back knowing he could sign the bill and toss the ball into Planned Parenthood’s court – literally. One has to admit his strategy is excellent. Although he won’t ultimately be the nominee – he sure would be following in his old boss’s artful use of manipulation of another issue – WMDs in Iraq – or lack thereof. But what he has really done is manipulate women’s healthcare services to prop up support for his presidential hopes. Over the past seven years, Mitch Daniels has attempted to paint his Indiana reign as one of an orderly haven of wondrous progress in our Midwest sea of woes. But Daniels has failed on numerous occasions. Who can forget his magical disappearing act when the Indiana House of Representatives flipped to a majority and he found himself unable to pass many of his legislative initiatives. And, who can forget his privatization mess with IBM – a situation that is still in litigation. And, to top it off, just as the new legislative session was underway this year and his presidential star appeared to be in quasi-rising mode, the uppity Democrats walked out of the legislature. Like a laser beam, the national spotlight shifted to Indiana with questions about Daniels’ struggle to govern given a missing delegation – not the type of publicity the Guv wanted as he continued to mull over a presidential run. And, now, Daniels finds himself hoisted “on the horns of a dilemma” – the Indiana legislature has given him a gift-wrapped opportunity to take a stand on abortion by defunding Planned Parenthood. But, if he signs the legislation, he puts the state at risk to lose an additional $4,000,000 in federal grants for family planning services – a loss that will hurt an already somewhat precarious financial situation. On the other hand, if he vetoes it, Daniels could antagonize ardent social conservatives already wary of his public statements about the importance of focusing on economic issues by calling a “truce” on social issues. Although he is not expected to make a decision for a few days, Daniels will, more than likely sign the bill, taking away millions in funding that is marked to help low income women obtain health care services. As Daniels mulls over his dilemma, the horns he finds himself riding are nothing compared to those of the women who will be deprived of much needed health care that has been available for decades through Planned Parenthood. But, when it comes to a potential presidential bid, why let the health of thousands of low income Hoosier women get in the way? 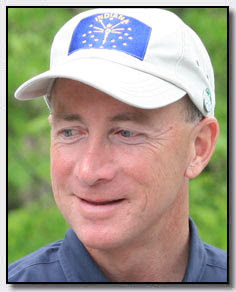 Indiana Governor, Mitch Daniels, is faced with a dilemma. Mitch Daniels comes from the corporate world which feeds on privatization and decreasing workers’ rights. Just hours after Mitch Daniels took over as governor of Indiana in 2005, he rescinded the rights of highway police, hospital attendants, mechanics, and other state workers to collectively bargain for wage and hour increases, working conditions, and other benefits. Under the theory that he needed to restructure the government and could not run the government efficiently with collective bargaining agreements in place – poor man – Daniels began his vendetta against state workers who were covered by collective bargaining agreement. However, in 2006, Daniels was forced to take a brief hiatus from his daunting task of destroying collective bargaining when Hoosiers turned the Indiana House over to Democratic control. Daniels became a “missing in action” governor with the disappearance of his rubber-stamp general assembly. But, last November, with the shift back to a completely Republican-controlled General Assembly, Daniels got back on his steed of destruction and once again began his ride to stamp out collective bargaining – this time turning his efforts toward the collective bargaining rights of teachers’ unions. To accomplish his goal, Daniels’ first move was to rid himself of Dr. Sue Ellen Reed, an experienced educator who was elected and who served four terms, two of those under Democratic governors. Reed’s bipartisanship when it came to Hoosier children just didn’t sit well with Daniels, who needed a superintendent of education who would kowtow to Daniels’ plans to rid the state of collective bargaining in public education. Daniels found his ally and soul mate in Tony Bennett, who had less than a year’s experience as a superintendent. Daniels backed Bennett in the 2008 campaign, effectively forcing Dr. Reed out of the race. Bennett was elected in 2008, and, with his new soul mate in tow, Daniels again turned his gaze toward the teachers’ unions and their collective bargaining rights, but, alas, he could not yet make his move since the Democrats maintained their Indiana House majority in the 2008 elections. Without a majority in the House as well as the Senate, Daniels and Bennett couldn’t get their horsey out of the gate. The 2010 elections gave Daniels and Bennett their dream come true – the Indiana General Assembly flipped – and heavily – to the Republicans. Now, Daniels had everything he needed to get rid of the collective bargaining in the public educational system. He had successfully forced out a bipartisan superintendent of education and replaced her with a clone of himself, and the Indiana General Assembly was now full of senators and representatives licking their lips and champing at the bit at the prospect of smacking down the teachers’ union through whatever means necessary. While Daniels and Bennett have been on a crusade to convince the public, in general, and teachers, in particular, that the changes to be made really are to help the suffering public education system, a more than cursory glance reveals how the proposals actually undermine collective bargaining. The real focus of Daniels and Bennett, though, is the push to establish new charter schools, which will have a major role in diminishing the role of collective bargaining. Charter schools can be created in one of two ways: either by converting an existing public school which has been forced to be abandoned by financial pressures, or by creating a new school. A charter converted from an existing school (requires approval of 60% of teachers and 51% of parents to convert) must recognize existing collective bargaining agreements. However, new charter schools do not have to recognize any collective bargaining agreements. Doesn’t take a rocket scientist to see which one will take priority. And, with the push to force existing public school corporations to “sell” an unused building for $1.00, creating a new charter school has a leg up on the a converted school. Talk about favoritism. allows the charter to go into debt without having to pay it back themselves, forcing their debt to be paid by the common school fund. Daniels has slashed the educational budget of the public schools forcing them to close schools, lay off teachers, cut services, and outsource service contracts. But his draconian budget cuts just weren’t enough. With the aid of the rubber-stamping General Assembly, Daniels and his yes-man par excellence, Bennett, have created additional avenues to completely weaken the public education sector and push toward the destruction of collective bargaining rights. Mitch Daniels has kept everyone in suspense about his potential presidential run – well those who care anyways. He has followed the old adage I remember from high school, “she ran so fast he caught her.” Daniels has played games like a coy teenager in his run up to whatever decision it is he will make. Daniels cleverly hesitates when asked about his plans, and he always ensures that his answer includes a conditional phrase or two. His appearance at the Conservative Political Action Conference (CPAC) was an opportunity for Daniels to show his stuff and to test the percentage waters. With his speech late in the evening, he certainly did not engender the enthusiasm that earlier participants received. He gave a solid, no-nonsense speech, and, as I watched a video, I couldn’t help but think that he just doesn’t instill excitement with his demeanor or his voice projection. A run for the presidency requires not only competency but also enthusiasm and excitement. While he has generated support from a group of Yalies, these youngsters won’t get him elected. Daniels just doesn’t have the necessary ingredients to win the nomination. His poor showing in the straw poll – 4% – also indicates that many are just not ready to get behind him. However, it should be noted that Ron Paul has won the poll before and has gone nowhere. His 2008 run ended in March of that year, well before the actual nominating process ended. The straw poll really is not an indicator, but it does show that those who voted are looking for name recognition and strict adherence to conservative principles – something that Daniels muffed when he suggested that the conservative social agenda take a back seat to the economic issues. Prediction? No run for Daniels. And, if he does, he will not be in for long. The Superintendent of our Indiana schools – and I use the word “Superintendent” lightly – Tony Bennett has been anointed to attempt to placate the fears of Hoosier teachers, parents, and supporters of public education as he and his boss move toward dismantling the state’s public school system. The Daniels and Bennett three-legged “stool” of educational reform is nothing more than a thinly veiled – and not too thinly veiled at that – effort to weaken Indiana’s public school system. The hostile “quasi-privatization” takeover plan asks the Republican-controlled House and Senate to rubber stamp various elements that are aimed at restructuring Hoosier public education. Daniels prefers to work at privatizing everything that can be turned over to big business, and, in Bennett he has found a comrade in arms. Of course, sometimes the plans go awry – the IBM welfare privatization scheme, for example. That one must have caused the Guv a great deal of anguish in the evenings as he tried to figure out what went wrong. Public education is a function of the government – as it should be. But, Daniels and Bennett see Indiana’s public school system as ripe for takeover by private entities – through two separate channels – voucher programs and charter schools. Both will divert students and funding away from our public schools. A necessary third prong to Daniels and Bennett is to weaken the collective bargaining power of the teachers’ unions. Vouchers are nothing more than payment from taxpayer funds to allow parents to avoid the public school system and select a private school in which to enroll their children. The concept sounds really great until a list of private schools is perused. In Indiana, 82.5% of private educational institutions are affiliated with a religious denomination (136 of 166). Indiana’s Constitution, in two separate sections of Article I, our Bill of Rights, prohibits the mixing of state and religion. Section 4. No preference shall be given, by law, to any creed, religious society, or mode of worship; and no person shall be compelled to attend, erect, or support, any place of worship, or to maintain any ministry, against his consent. (History: As Amended November 6, 1984). Section 6. No money shall be drawn from the treasury, for the benefit of any religious or theological institution. The push for vouchers violates both of these sections, yet Daniels and Bennett seem determined to ignore Indiana’s constitution in their push to divert public funds from public schools. Although the Indiana Constitution would appear to prohibit such a voucher system, the United States Supreme Court, in Zelman v. Simmons-Harris, 536 U.S. 639 (2002), upheld an Ohio plan to allow the use of school vouchers. The decision did not impose a mandatory requirement of using vouchers, and, in fact, some state supreme courts, including Florida and Arizona, have since determined that the use of vouchers in their state public school systems was unconstitutional. For 60 years, the state of Indiana has been on a bender to reduce the number of school systems by mandating school consolidation under the theory that consolidations cut expenses and provide greater resources. Establishment of charter schools is in direct contradiction to that 60-year policy, yet Bennett and Daniels are determined to throw that policy out the window in their rush to tear down the Indiana public school system. Charter schools are schools which are given the right to exist but are given their existence in a different way than the traditional schools. They are “chartered” or created by an entity distinct from yet under the control of the state. In Indiana charter schools can be proposed by a sponsor, by a governing body of a four-year state educational institution, or by an executive of a consolidated city. (1) Serve the different learning styles and needs of public school students. (2) Offer public school students appropriate and innovative choices. (3) Provide varied opportunities for professional educators. (5) Provide parents, students, community members, and local entities with an expanded opportunity for involvement in the public school system. No differences exist, and the public school system was created for the very same purposes listed for charter schools. So, why the rush to charter schools? Charter schools also have an advantage in the review process. They need to be reviewed once within a five-year period of time. Thus, theoretically, a charter school could go for eight or nine years without a review. For example, if the school were reviewed in the first or second year that would satisfy the review requirement for that five-year period. Then, perhaps the school would not be reviewed until the ninth year of the next five-year period. The charter school has been given a pass and does not have to be reviewed nearly as often as the public schools. Charter schools also do not have the stringent requirements for teacher licensing that are required of the existing public school systems. Charter school teachers do not need licenses when they are hired – the requirement is that the teacher needs to be “in the process” of obtaining a license and has three years to complete the process. The teacher could spend three years without a license and then move on without ever having obtained a license while at the charter school. Charter schools come in two varieties: those that are created and those that are converted. Those created are new schools and do not start with collective bargaining agreements. The teachers are allowed to organize if they want to and have the ability to do so. Those existing schools which are converted must recognize the existing collective bargaining agreements. Given this difference, Daniels and Bennett will more than likely go for more new schools than converted schools. Charter school conversion requires 60% of teachers to agree and 51% of parents. It doesn’t take much math to figure out that Bennett and Daniels will go for new schools. Conversions will be few and far between. Why use conversions that need approval when new schools can be created without the bother of teachers and parents? Charter schools take public funding from already existing schools. The pie is just so big, and, by increasing the number of schools, the pie gets smaller. Our existing public schools get less of everything with the creation of more schools. This decrease in public funding assures that our existing schools will only continue to receive less and less, spiraling down ward with less and less to serve their existing students. This one is a no-brainer. Charter schools can be established without collective bargaining agreements. Vouchers can go to private religiously-affiliated schools without the worry of unions. Bennett and Daniels primary goal is to weaken the public educational system by the use of vouchers, by increasing the creation of charter schools, and by dismantling the ability of teachers across this state to enter into collective bargaining agreements. How is it that Bennett and Daniels justify the creation of additional schools when the last 60 years has been spent decreasing the number of schools – all in the effort to save money and increase resources? Their goal is simple – Bennett and Daniels are using a completely controlled Republican General Assembly to weaken the public education system in Indiana. Bennett’s wife, Tina, recently resigned from a position that put her squarely in a conflict of interest. While her husband was pushing to increase charter schools, Tina Bennett was employed by a company that worked with charter schools. Tony Bennett had the audacity to suggest this was not a conflict of interest. Bennett and Daniels have a vendetta against our Hoosier public education system. By using several avenues, they hope to eventually dismantle the public school system in Indiana. I read everyday about the Indiana budget and how education, salaries, social programs, etc. must be trimmed in order to ward off the state’s financial problems. So what does the Little Napoleon do? Senate President Pro Tem David Long, R-Fort Wayne, sent out a statement Friday touting what his chamber is doing to rein in spending after Gov. Mitch Daniels announced spending cuts. But less than 10 minutes later another release from Long appeared – this one welcoming a new policy analyst. So much for that hiring freeze. Senate officials later defended the hire as essential to the operation of the chamber. Scott Minier, communications director for the Senate GOP, said there was no conflict. The freeze, he said, applied to “non-essential, noncritical and new positions.” A policy analyst, he said, is essential. And what does the new, totally essential employee get as compensation while others are seeing freezes and cuts? Why, a mere $90,000. Oh, come on. It really is time now – 40 years later – to get over blaming Boomers. I have heard ad nauseum for decades now how the Boomers have ruined the world. It really gets old – especially when it isn’t true. Since my generation of the 1960s, two more generations have entered the world’s stage – and have done quite a bit to mess things up. These youngsters are also called the “me” generations. Those born in the 1970s have been dubbed Generation X (born to the Baby Boomers) and those born in the 1980s and 1990s have been dubbed Generation Y (Echo Boomers). Both of these groups are today’s young people, those who also have been accused of being selfish and taking for granted that the self comes first. But ya got give the guy credit – at least he stayed true to his character: nothing to say, so cry and whine and find a scapegoat for his lack of inspiring advice.